Southeast Asian cities have much in common: urban sprawl, the hustle and bustle of daily life, colorful street flair, impossibly crowded roads, and a history of tenuous human rights protections and unresolved impunity for mass human rights violations. Like a typical traffic jam in a Southeast Asian metropolis, accountability has had some jolts forward and many halts. What are some of the root causes of impunity in Asia? How is impunity for mass violations manifested in the present? 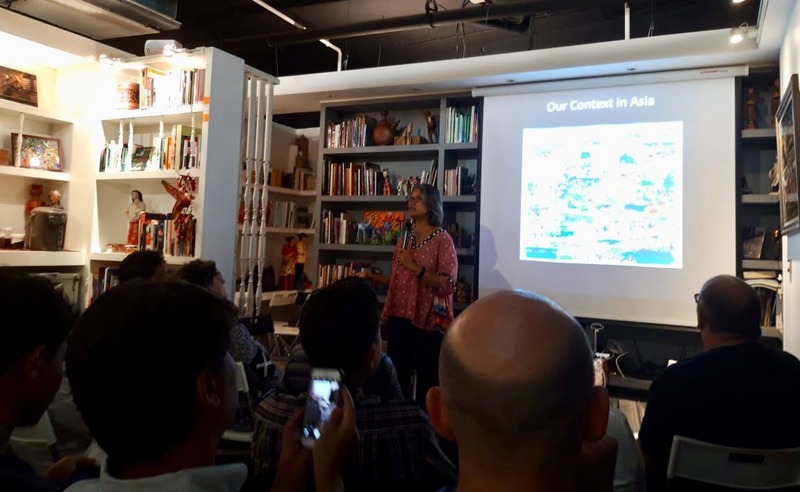 On 11 September 2018, members of the Transitional Justice Asia Network (TJAN) addressed these questions in Bangkok, Thailand. Galuh Wandita (Indonesia), Director of Asia Justice and Rights (AJAR); Rene Clemente (the Philippines), Senior Programme Officer of Alternative Law Groups; and Pornpen Khongkachonkiet (Thailand), Director of the Cross-Cultural Foundation shared their experiences of pursuing accountability in their countries and the greater region during a panel discussion organized by SEA-Junction. TJAN was established to build a strong knowledge base and extensive network to address impunity in Asia by amplifying the voices of human rights practitioners through regional exchanges and in-country activities. With AJAR serving as its secretariat, TJAN has grown, engaging more than 62 experts who push for accountability through various transitional justice processes across Asia. 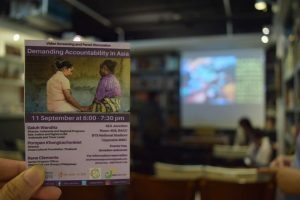 Prior to the panel discussion, selected episodes from the Transitional Justice in Asia Video Series were shown to the audience. This video series features various Asian and global experts, including commissioners of former and current truth commissions, human rights defenders, and survivors of human rights violations who share their experiences of transitional justice in Asia. Watch the video series here. Reflecting on their struggles to strengthen accountability across Asia, the panel speakers emphasized the importance of supporting survivors and activists who are working to resist impunity. The experiences of Timor-Leste—a country that has seen the most complete transitional justice process, from a hybrid court, to two truth commissions, to the recently established Centro Nacional Chega! 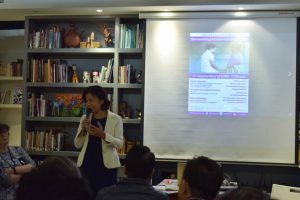 (a follow-up institution to preserve memory and assist victims)—show, as Galuh pointed out: “strengthening survivors is the foundation of accountability in Asia.” In the Philippines, despite a wave of extrajudicial killings and efforts to use social media as a weapon to attack human rights voices, coalitions and alliances are being formed among different stakeholders to document and raise awareness of current mass violations and to push for justice and reparations. In Thailand’s context where freedom of expression is limited, civil society is pushing for a criminal justice system that delivers protection and justice for victims of human rights violations. “Our hope is for the new generations to get information [on accountability and justice issues in Thailand]…listening to unpopular voices is helpful,” Pornpen remarked. TJAN does exactly that—it promotes accountability through victim-centred, process-driven initiatives that aim not only to deliver and support transitional justice mechanisms, but also to transform societies so that the root causes of mass violations, in the past and that continue, are addressed. Learn more about TJAN and to access its resources.